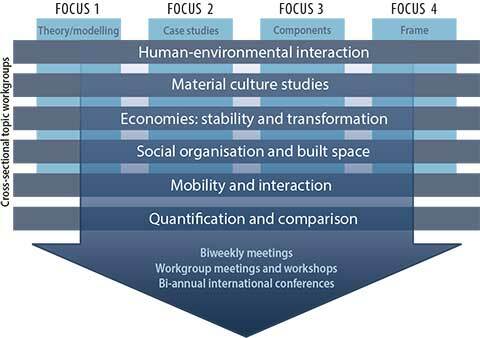 The interlinkage of the four research foci is realised along six specific Interlinking Groups. The concept aims at uniting overarching expertise from the different sub-projects to develop comprehensive approaches facing prehistoric and archaic transformation processes in all their diversity. Cross-sectional topics link the CRC foci in workgroups and enhance three levels of dialogue and discourses in the CRC 1266: The bi-weekly meetings (Lunchtime Seminar), the interlinkage in workgroup meetings and retreats, and bi-annual international conferences (GSHDL International Open Worshop 2107).